Either indoors or outdoors, a fire feature or fireplace is a welcome addition. The fireplace provides warmth, light, a cooking source and, of course relaxation. There is something mesmerizing about watching the flames of your fire as they dance. Our fire pits are made of cast concrete and designed to be powered by either LP or Natural gas. We stock several popular shapes for quick delivery. Our stock includes round, square and rectangle shapes. Of course we can produce almost any shape or size to complement your architectural plan. 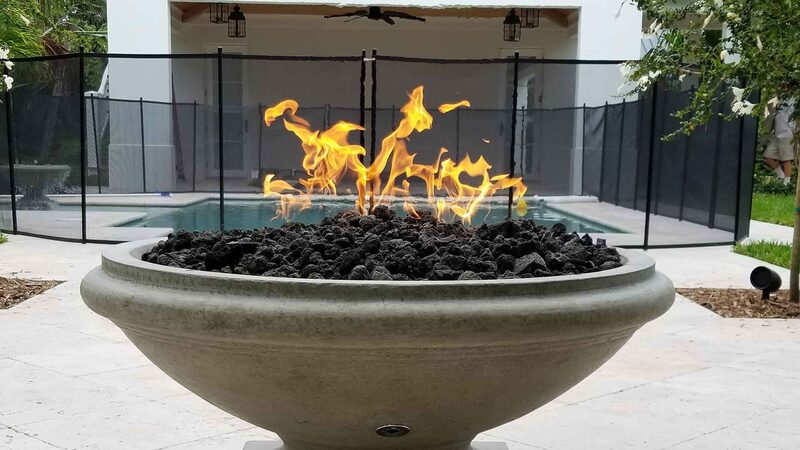 Our Concrete Fire Pits can be delivered as a turnkey item ready for use, or as the fire bowl/pit alone and outfitted by someone else. Local Florida delivery is available, and shipping can be arranged as well. Any color, finish, shape, style can be created. Call or email for pricing and ordering details. epoxyfloorsverobeach.comTM, Designer ConcreteTM, Hawaiian Island Wall ArtTM, and WoodCreteTM;, are registered trademarks of DCC, LLC. All rights reserved.